Lovely Handmade Cotton Kantha Women Handbag Tote Bag in Vintage Kantha Quilt. New design handmade kantha women bag. Everyday use women shopping bag. Antique design unique colour women bag. Beautyfull Designer bag women stylish bag . Traditional handmade gift item kantha leather bag. 100% pure handmade kantha and pure leather lining women bag. 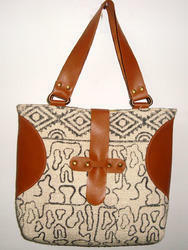 New leather handmade kantha women bag. Traditional handmade leather women bag. Unique colour combination and pure leather handmade kantha bag. Antique fitting strap hand bag. Everyday use women shopping,office,college bag. 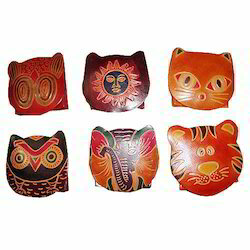 Traditional handmade gift item bag. Designer handmade women shopping bag. Antique design Unique colour women everyday bag. *Top quality canvas and 100% Genuine leather. *One large zippier pocket with two small inside open pocket s and one inside zippier pocket. 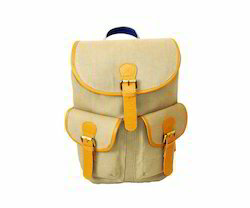 *One pocket outside leather cover and shoulder strap length is freely adjustable unisex. 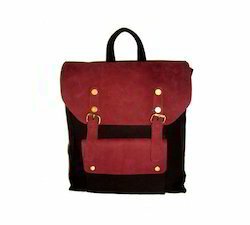 *The bag features a distinctive leather smell and the bags is too comfort for school bags. 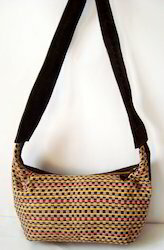 Handmade kantha leather designer bag. Antique design unique colour handmade bag. With the valuable assistance of diligent professionals, we are offering a vast range of supreme quality Rug Leather Bags. 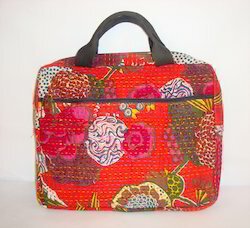 Lovely handmade Cotton Kantha Laptop / Handbag Bag in Red Color. Floral Print Designs on both sides of Bag with ykk zipper. One zipper in front of bag and having the long strap. Leather Handle, and fabric lining inside. A Perfect Carry Bag / Beach Bag / Handbag to give to elegant look with any outfit. The kantha fabric gives an alluring sense of style in the design of this handbag. 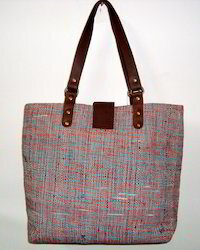 New leather pure handmade kantha tote bag. Antique design kantha leather bag . Unique multicolour handmade kantha leather bag. Made of handwoven fabric with front pocket behind canvas belts, making it easy to carry on shoulders Thick heavy fabric with rubber padding inside for carrying bulky stuff, Wide pockets Trims made of pure leather with pure leather handle on top, adjustable back straps.Cotton lining inside with extra pockets and zipper pocket. Our bags are strictly produced by our skilled team with the natural traditional way of craftsmanship. Pure handmade kantha leather traditional kantha wallet. Everyday use kantha leather women clutch. Antique designer Unique colour leather kantha hand purse. pure handwork kantha and pure leather wallet. Zip closer safe item wallet. 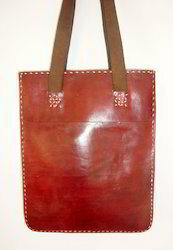 New leather handmade rug tote shopping bag. Everyday use rug bag . Unique colour combination women bag. Antique Design handmade rug women bag. 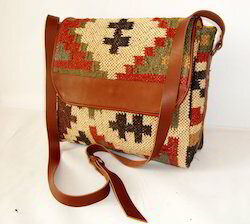 *Handmade kantha leather laptop bag. *Large space for Laptop, papers and notebooks. *Antique vintage handmade kantha leather bag. *A very smart and useful briefcase. This is a Kantha Clutch, very lovely design, can be used in all seasons. The soft foam padding, contrast cotton attractive floral printing stripe inside, a zip pocket inside and other pockets where you may kept a precious things. YKK zippers and all antique fittings. Good vintage condition! Structurally excellent, clean interior. A Perfect to give to elegant look with any outfit. 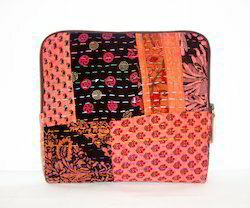 The kantha fabric gives an alluring sense of style in the design of this clutch. Lovely handmade Cotton Kantha Women Handbag Tote Bag in Vintage Kantha Quilt. Stripe Print Designs on both sides of Bag with ykk zipper. One zipper in front of bag. Leather Handle and fabric lining inside. 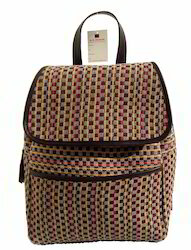 A Perfect Carry Bag / Beach Bag / Handbag to give to elegant look with any outfit.The kantha fabric gives an alluring sense of style in the design of this handbag. 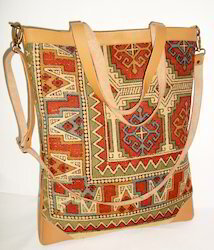 *Large Vintage bag made of patchwork and antique brown leather. *Antique vintage fabric, cotton twill lining, leather piping and antique trims. # Note : "One of a Kind"
*These are beautiful bags that are made from genuine vintage kantha and original leather*The art of kantha work is rare and almost extinct. *It is manufacture in India Jaipur. 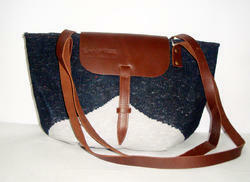 *Bags are lined with a multiple color with inside pockets.